Recently I gave a presentation to a group, which was undertaking a six-week health transformation through changed eating patterns and exercise. It is always great to talk to those who are on the path to improving their health and who are keen to learn more. Of course doing a program can also have its frustrations, as some people can appear to be making more headway than others. Equally progress can be made on the inside, with regards your metabolic health and not everything has to be judged on the number of kilograms lost. However, it is also on the inside where your progress can be held back. One person described doing regular exercise and being on a calorie controlled eating program but still struggling to lose weight. The question was whether stress could be a factor? The answer is yes. When we are stressed we produce more cortisol and adrenaline. These hormones tend to inhibit fat burning. Cortisol is associated with storage of fat around the mid section. Historically when we were stressed it was important to have some energy in “storage”. Keep in mind stress used to be about predators or lack of food, not electricity bills or relationship issues. But our body reacts the same way. So when we are stressed our body is trying to conserve energy. This is of course the exact opposite of what we are trying to do when wanting to lose weight. The same principle applies when we eat carbohydrates and the body release’s insulin, which promotes fat storage and inhibits fat burning. No wonder those on a high carb and low fat diet struggle to get anywhere! The interplay of hormones within the body is complex but we can get them working for us not against us. Eating a higher fat/lower carb diet means less insulin production. 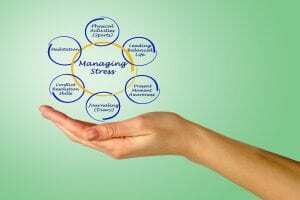 Managing our stress will reduce the amount of stress hormones like adrenalin and cortisol in our systems. We need a certain amount for stress and the right amount of these hormones- just not too much (or too little). There are other simple things that we can do to keep our cortisol levels in check. Getting a good nights sleep is one, as is doing regular exercise. These both also help with stress management. Of course having some relaxation time is vital. This includes doing things just for fun. Laughter is the best antidote to stress. And this is why humourless political correctness is so toxic. People stress about every word they say and are not allowed to laugh at or make jokes. Good relationships with friend’s, family and colleagues also lower stress hormones. Not surprisingly, so does caring for a pet. Aside from being good for the insulin system, being on a low carb diet is also good for the adrenal hormones (including cortisol and adrenalin). Through all this it is important not to stress if you don’t get it 100% right all the time. Nobody does. If you can get most of it right most of the time you will be fine. Being healthy is not difficult when you focus on the basics pillars of health.